When defining the structure of your story, who you are looking at and who you are looking from within matters. NOTE: While interesting in context of the development of my knowledge of story, this article is inaccurate. Angiers (Jackman) is the Main Character for the very simple fact that we are with him when he learns new information. Main Character is a perspective, not a movie star. Although much of The Prestige shrouds itself in mystery, identifying one of the prominent roles as the Main Character is not as difficult as it first seems…as long as you understand the difference between sympathy and empathy. Both are questions relating to point-of-view. The first identifies the personal “I” perspective. The second signifies the impersonal “You” perspective. Both are needed in a story, but only one represents our place as an audience within a story. For now, we’ll concentrate our discussion on determining that perspective we share - that of the Main Character. 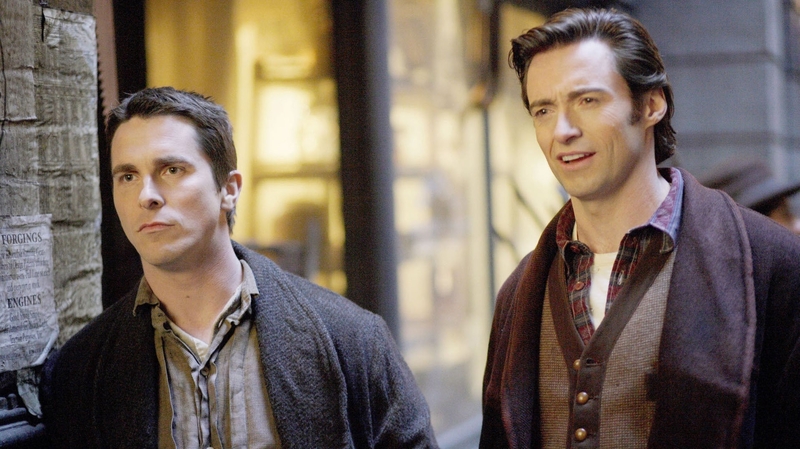 In The Prestige (2006) you have two battling magicians - Hugh Jackman’s Robert Angier and Christian Bale’s Alfred Borden. Both are given equal screen time throughout the picture and both communicate to us through a first-person narrative. Narration, however, no matter how personal, is not enough to give a character the label of Main Character. Instead, we look to the two characters for a personal point-of-view. Jackman is the first to receive our sympathies with the accidental drowning of his own wife. This tragic event, along with his less than perfect magic skills, is enough for us to feel sympathy for him. But it is not enough for empathy. When looking to the Main Character we want to find out who we empathize with most. Through who’s eyes do we witness the story? Are we looking at this character, or are we looking from within this character. Take the very next scene at the morgue as Angier and company pay their respect. At the top of that scene pay special attention to the camera angle. We’re not there at the base of the coffin, weeping along with Jackman. Instead, we find ourselves an outsider from the group, pushing our way in towards this sad scene. We’re low to the ground because we feel low - slithering our way in. It is as if we are Christian Bale entering a place we are not welcome. We pay sympathy to Jackman but empathize with Borden’s anguish towards the deadly miscalculation he has made. It can’t be denied that both go through extraordinary lengths to be the best. While Hugh takes a bold step into that machine every night, we never get a sense of what it truly feels like to be the real Transported Man. We watch him enter the cage and we’re shocked at the end by what commitment he had towards acheiving notoriety - but we ultimately don’t feel like we are him. We do, however, feel more of what it would be like to dupe someone we love very much (Borden’s wife Sarah). And we feel the overwhelming risk of our actions possibly sending our own child to the workhouses. And finally, we feel what it would be like to willingly have two of our fingers chopped off for the sake of keeping a secret - we experience that act on-screen. In contrast, we don’t feel what it would be like to drop into that water tank each and every night. Personally, Bale’s Borden as Main Character is a visceral notion for me - I just felt more for Bale’s character than I did for Jackman’s. I was sad to see Bale’s brother executed, but happy to see Jackman shot. Why would I feel this way? Wasn’t Jackman simply seeking revenge for the death of his wife? The difference comes in the way the authors presented the motivations behind these two men. Jackman’s act of revenge (framing Bale for his own murder) was premeditated and sinister while Bale’s killing of Hugh’s wife was entirely unintentional. Bale’s action was stupid (the knot tying), but it was not malevolent. You can have empathy with reprehensible characters, but I don’t believe that was the intention of the authors (director Christopher Nolan and his brother Jonathan). Outside of the story, it is apparent that Christian Bale is a favorite for Nolan (having starred as Batman in Batman Begins). Since a storyform is merely one way of examining author’s intent, it would seem to make sense to assign Bale to the role of Main Character. Besides, Christian Bale simply has more screen charisma than Hugh Jackman! It’s true that we really don’t know Bale’s secret until the end. But when trying to parse out the storyform, you can’t take storyweaving techniques at face value. You can’t let the mystery of the narrative cloud your judgment. You have to really look inside the story and see it all at once to fully appreciate what perspectives were in place. From the vantage point of the storyform, we’re the author, not the audience.